The fall is the ideal season to swap out an old cooling and heating system for something newer, sleeker, and more efficient. As we enter the colder months of the year, you’ll increasingly rely on the residential heating system to keep you warm and comfortable on chilly nights and icy mornings. Before those brisker temperatures arrive, early fall offers a perfect opportunity to set up a new HVAC system in the home. Increased HVAC Efficiency: Upgrading the home to a new system will guarantee an increased level of energy efficiency. Once the weather starts dropping and you start turning on the heat daily, you'll save money immediately. More Comfort: Upgrading to a new system ensures that family members will never have to worry about shivering inside the home. Preparation for the Holidays: Between Thanksgiving, Christmas, and New Year's, many homeowners have friends and family staying over for at least part of the holiday season. Make sure you give guests a toasty, comfortable place that is worth returning to. 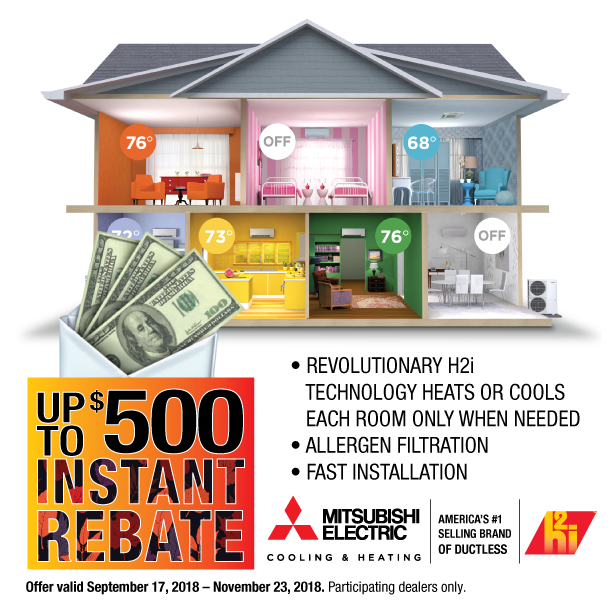 Up to $500 Off Mitsubishi® Electric System! Beginning on September 17 and going through November 23, the Mitsubishi Electric Diamond Contractors™ at Atlantic Heating & Air Conditioning in Norfolk County, MA, are offering up to $500 off Mitsubishi Electric HVAC systems. This incredible offer makes the next few weeks the perfect time to upgrade the home's cooling and heating system to a Mitsubishi Electric AC—a multi-zone heating system that is one of the most technologically advanced, energy-efficient HVAC units on the market. As recent client Katlyn S. put it, Atlantic Heating & Air Conditioning offers "Probably the best customer service you could ask for when the cold snap hits and your heat is not working. They came late in the evening to help. They installed a new furnace 24 hours after we met the sales representative. He was outstanding too. Very personable and informed. Managed our order with kid gloves. Highly recommend this entire organization." Contact These HVAC Contractors Today! Atlantic Heating & Air Conditioning has been providing top quality cooling and heating systems to residents in the Greater Boston area since 1962. Visit their website to learn more about their services or call (617) 566-6990 to schedule a free estimate.